mycotoxins as well as 3- and 15-acetyl-deoxynivalenol, deoxynivalenol-3-glucoside, nivalenol, its acetyl derivative fusarenon X and sterigmatocystin. The sample preparation follows a simple dilute-and-shoot approach after extraction of cereals and maize with a mixture of acetonitrile/water. The analysis was carried out on a Thermo Scientific™ UltiMate™ 3000 LC system coupled to a Thermo Scientific™ TSQ Endura™ triple quadrupole mass spectrometer. For the evaluation of the method performance, wheat and maize matrices were chosen. The method parameters that were characterized were linearity, LOD/LOQ, injection precision and matrix effects. The LOD/LOQ values that were determined in solvent, wheat and maize matrix were compared to the EU legislated values and are suitable for all analytes to monitor the contamination level in cereals. The method is suitable and recommended for the analysis of 17 mycotoxins in cereals and cereal-based foods. 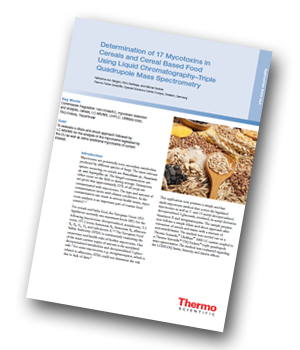 It enables quantitation that is compliant with the ML set by the EU for mycotoxins in cereals. With exception of aflatoxin B1, the same method could be applied for analysis of baby food samples.